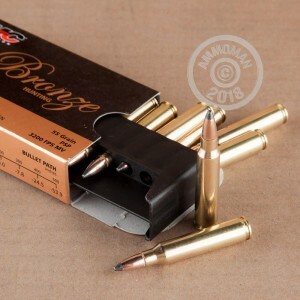 PMC Bronze ammunition is one of the most commonly encountered brands at shooting ranges due to its low cost, reliable performance, and good accuracy. This .223 Remington variant is an excellent choice for both target shooting and varmint hunting. 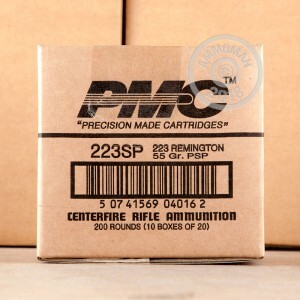 Each round in this box of 20 fires a 55 grain soft point bullet at 3,200 feet per second. Soft point projectiles are particularly well-suited to the .223/5.56 cartridge due to its high muzzle velocity, which helps the projectile expand into the desired "mushroom" shape. This ammo is made in South Korea using non-corrosive Boxer primers and reloadable brass cases. Poongsan, the maker of PMC ammo, has a long history of producing mil-spec cartridges for the South Korean military.